I've been working on a new character for the last few months and on Saturday I get the chance to try it out for the first time on the unsuspecting public. The character is a waving car wash mannequin. You don't see many of them about these days, but I remember when I was younger, you used to see them all the time, waving to passing motorists, advertising the presence of a car wash; One particular one in at the top of Lea Bridge Road by the Clapton Roundabout in Hackney, sticks in my mind. I believe that they were a hand car washes too; Maybe the rise in popularity of the automatic car wash caused them to disappear. As an aside, for the last couple of years, I had noticed a huge resurgence in hand car washes. These mannequins were motorised with a simple arm waving motion, and used to be generally dressed in yellow wet weather gear. I decided to make this character's face and hair all the same colour with the hair, hard and stylised, to look as much like a mannequin as possible. The first task was to make the wig. 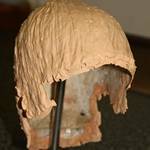 I've make a few hard wigs using Papier-mâché, and generally they have turned out well. Generally I start them out on Dave and then mould them to my own head. This time, I wanted to get a fairly stylised look, so big ridges representing the hair. So after trying a few materials out I struck on the idea of using cling film, twisting it into strings, and layering it on the base. The effect was great but it took many hours to cover the whole wig, so next time I may try untwisting some polypropylene rope as an alternative. After the wig was finished, I gave it a few coats of liquid latex, so that it would match my face make-up. Looking forward to seeing how the new character looks and what reactions I get.